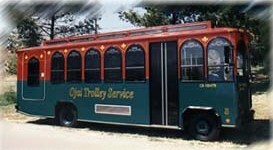 The City of Ojai has run the Ojai Trolley Service since 1989. It provides transportation service on a fixed route schedule throughout Ojai, Meiners Oaks and Mira Monte via about 45 stops (though typically they only stop at about a third of the stops on a given route, based on if there are people waiting at each stop). Roughly 5 mile route one way (eastbound or westbound). It costs $1 to ride the trolley (as of June 2017), 50 cents for 65+, 25 cents for ADA and Medicare cardholders and free for kids 5 and under. Day passes are available for twice the standard admission cost. The trolley runs 7 days a week, every day of the year except Easter, Memorial Day, July 4th, Labor Day, Thanksgiving Day, Christmas Day, and New Year's Day. Hours are 5:36am to 9:27pm Monday through Friday, 6:06am to 8:27pm Saturday and 7:06am to 8:27pm Sunday. For more information and a detailed schedule, visit www.ojaitrolley.com. Or call 805.646.5581 x207.